During the museum’s first ever solo exhibition, dedicating all 3 galleries to a single artist, President and CEO, Charles Shepard interviews Robert Kipniss on his life and work as an artist. 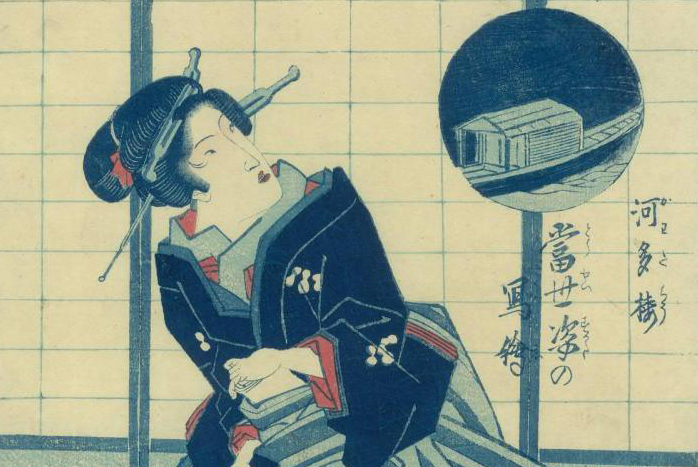 “Azuri-e Courtesan Beauty” by Eisen, original Japanese woodblock print, 1820s, Things Japanese Gallery“In the Loupe” is a series that closely examines the history, meaning, and creation processes behind the most fascinating types of collectible art and antiques. Japanese woodblock prints date back as far as the eighth century BC. 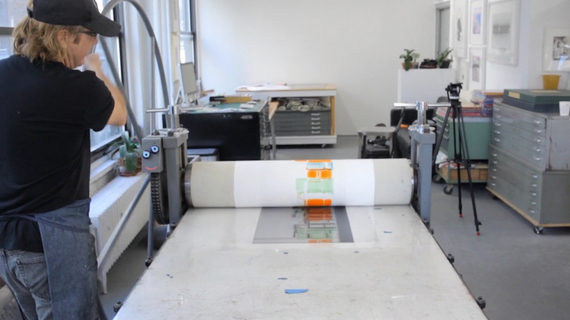 The printmaking process, which was much more labor intensive than modern techniques, was initially used by temple monks to reproduce and disseminate Buddhist texts more efficiently than they could be by hand. After technological advances in the 18th century enabled printing in full color, woodblock printing as an artistic medium began in earnest. Printmakers who had previously produced monochromatic manuscripts were now able to create polychrome prints and elaborately illustrated calendars for wealthy patrons. Despite the occasional hefty price tag, collectors around the world continue to appreciate the timeless and captivating beauty of Japanese woodblocks. To help us better understand why these fascinating works of art are so highly sought after, James J. Plumer, Appraiser of Oriental Arts at Alex Cooper, Brendan B. Ryan, Appraiser and Auctioneer at Butterscotch Auction Gallery, and Daniel Levitz, owner at Things Japanese Gallery took us further into the history, techniques, and valuation of Japanese woodblock prints. 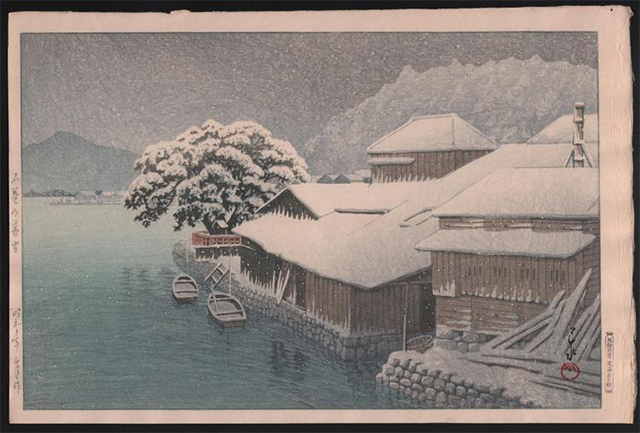 Across the market, Japanese woodblock prints range in value from a few hundred dollars to upwards of a million. 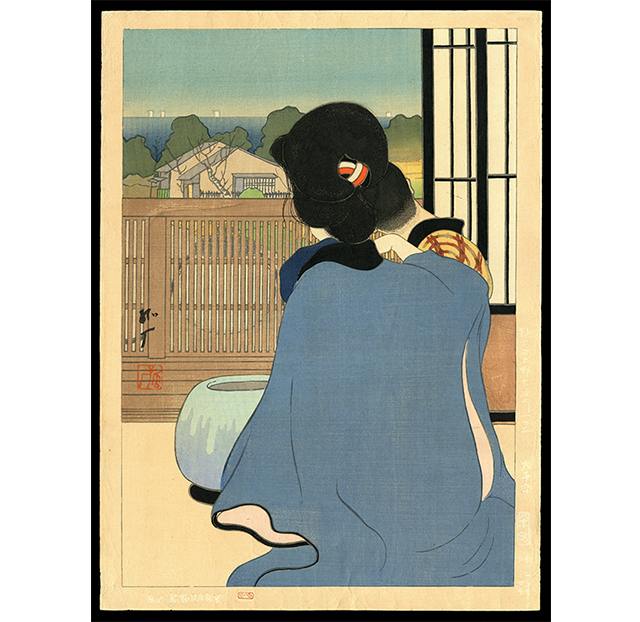 Exceptional works by master printmakers like Utagawa Hiroshige, Katsushika Hokusai, and Kitagawa Utamaro, which tend to make infrequent appearances on the open market, fetch impressive prices due to their age and rarity. The Hokusai woodblock print,”Fugaku sanjurokkei,” from “36 views from Fiji,” sold at Christie’s in 2002 for a whopping $1.47 million. An Utamaro woodblock titled “Fukaku shinobu koi” sold at the French auction house Beaussant & Lefèvre in June of 2016 for $675,000. “Today, there is an enormous amount of Japanese woodblock prints available to purchase online, the great majority of which are later editions or reproductions, so there is a lot of excitement when earlier editions come up for sale,” says Ryan. 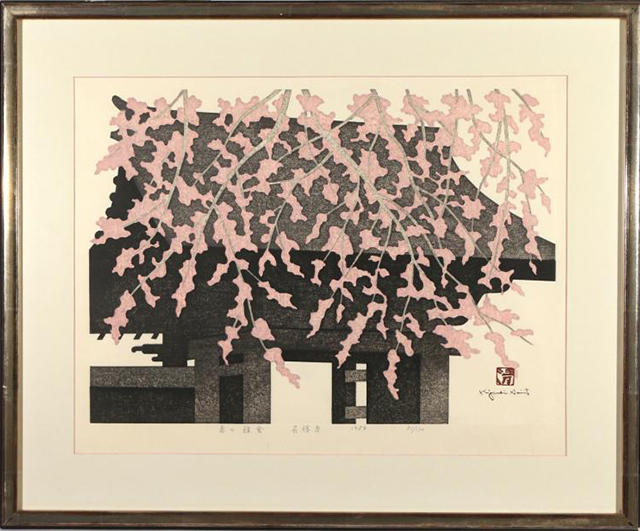 While woodblock prints are often attributed to a single artist, the artworks typically represent the combined efforts of four specialists: designer, engraver, printer, and publisher. 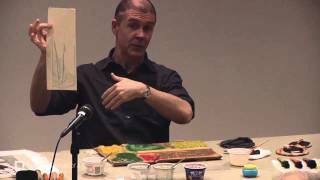 “The process of creating Japanese woodblock prints traditionally was a collaborative effort. The artist, who would have his signature on the finished print, would first execute a drawing or painting which would be the original source for the finished woodblock print,” says Levitz. The engraver then took over and traced the original drawing to create a negative, in a series of woodblocks used for printing. “Sometimes multiple carvers would be used, as many of the designs used multiple blocks,” adds Levitz. Polychromatic prints sometimes required as many as twenty separate woodblocks. When it came to the actual printing of the piece, yet another artisan would be involved. In fact, there might have even been multiple printers. The printer or printers coated the block and laid a piece of paper on top of the block to generate an impression. The finished print was later distributed for sale by the publisher. While multiple woodblocks were often used in the printmaking process, that number used does not impact the value of a print. “There are most certainly more complex designs that are successful artistically and commercially. 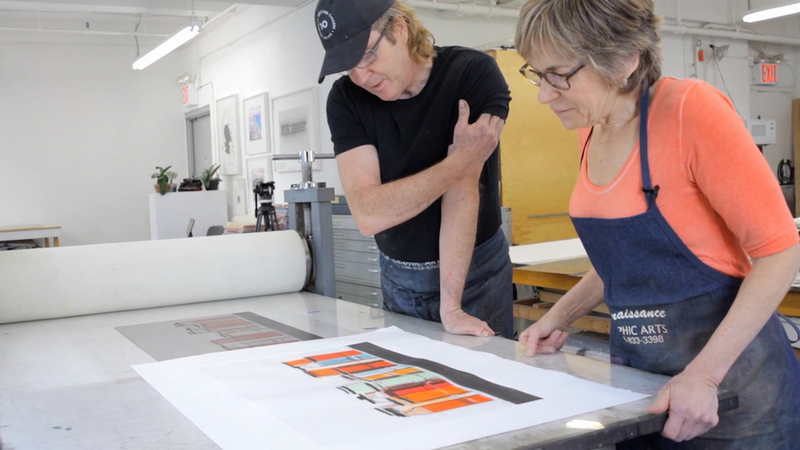 It’s the subject and quality of the design are the most important aspects of a print,” says Levitz. Throughout the 17th through 19th centuries, the “Ukiyo-e” genre of art flourished in Japan. 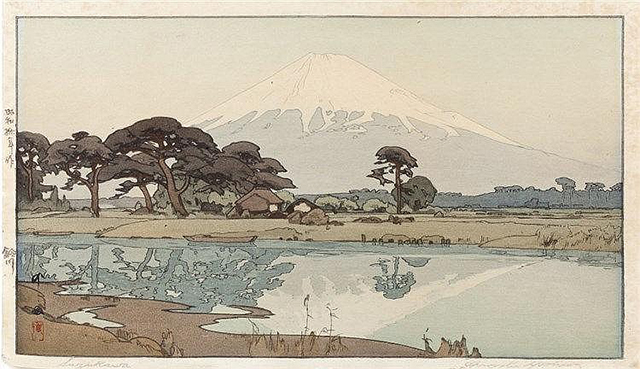 During this period, which translates to “pictures of the floating world,” many of today’s most renowned Japanese woodblock printers rose to popularity. The late 18th century is considered the golden age of Japanese woodblocks, owing to the wealth of artistic talent and a shift in subject matter. Woodblock prints of the Edo period (1615-1868) characteristically featured sumo wrestlers, famous Kabuki actors, and geisha performers. Toward the end of the 18th century, this kind of portraiture declined in popularity, replaced by a demand for romanticized landscapes and depictions of notable historical scenes. “Popular motifs depict Japanese culture, including female beauties, Samurai warriors, actors, and landscapes,” notes Plumer. 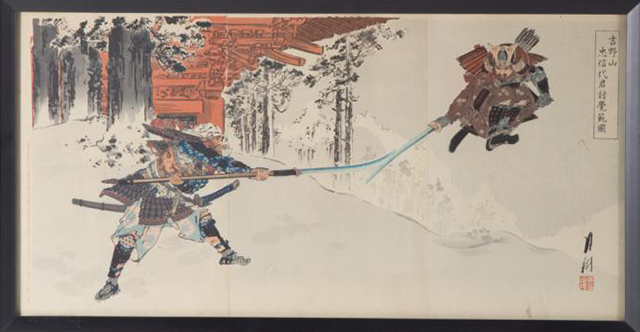 “Japanese woodblock print that portray Samurai warriors, for one, are increasingly popular at auction,” says Plumer. Perhaps the two most renowned practitioners of the woodcut, Hiroshige and Hokusai, emerged in the 19th century. Hiroshige created tranquil and ethereal landscapes, most notably in a series called “The Fifty-Three Stations of the Tokaido.” Hokusai created graphically bold compositions including “Great Wave of Konagawa,” which endures as one of the most celebrated works in the history of Japanese visual art. 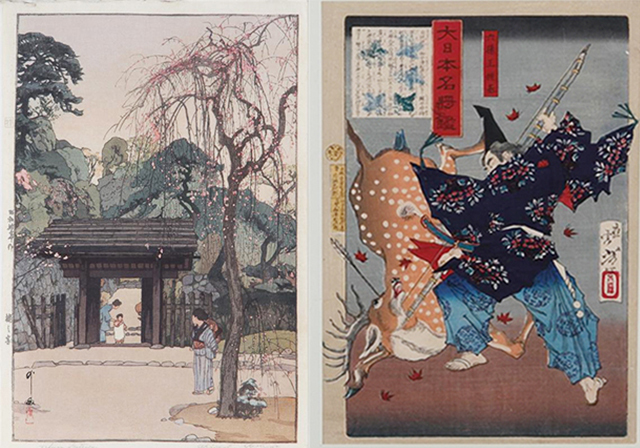 Woodblock prints have had a profound influence on the trajectory of the visual arts in Japan and throughout the West. Impressionist painters influenced by Japanese printmaking developed an aesthetic called Japonism, which fused traditional European styles with Japanese elements. Artists including Edgar Degas, Henri de Toulouse-Lautrec, and Vincent van Gogh incorporated the high-keyed contrasts, flattened perspective, and compositional strategies of Japanese woodblocks into their work. Ultimately, the best way to determine quality or worth of a woodblock print, notes Plumer, is to bring it to a museum or auction house expert that specializes in oriental art. Depending on maker and quality, the price of a print could range greatly, so getting a specialist’s take is often crucial before bidding and buying. 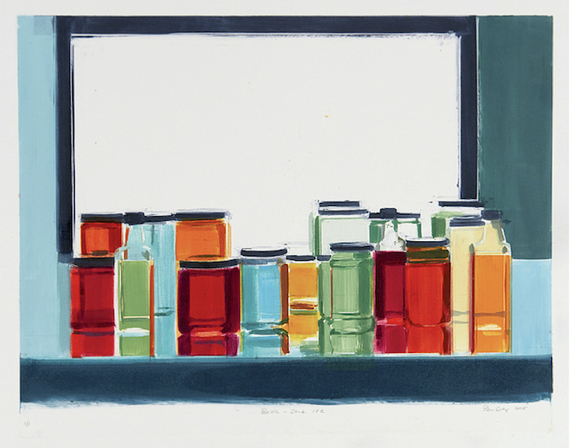 The Fort Wayne Museum of Art recently acquired the archives of this preeminent American artist, an award-winning figure popular in the New York gallery world in the 70s, 80s, and 90s. 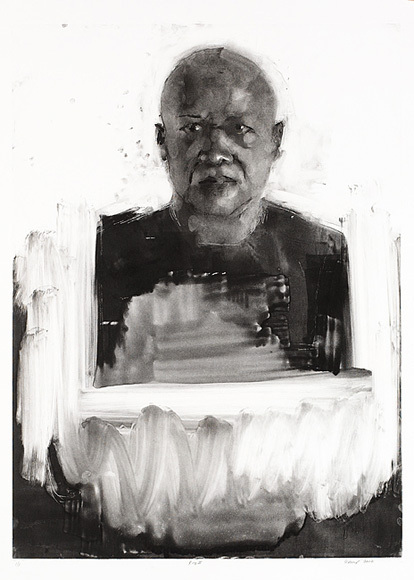 His work is collected by major institutions worldwide, including The Whitney Museum of American Art, the Metropolitan Museum of Art, The Art Institute of Chicago, and The British Museum. President & CEO and Chief Curator Charles Shepard will take you on a gallery tour of this exhibition. From his specialized and personal point of view, Shepard offers a unique perspective as the visionary for all exhibitions at FWMoA. Tours are free with gallery admission. 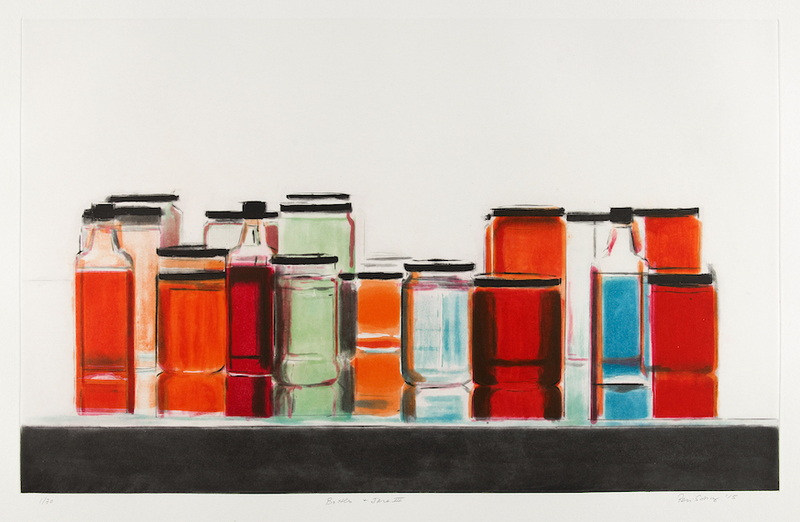 “Now onView” celebrates extraordinary works on paper created within the past 500 years, none of which have ever been on view at the Portland Art Museum in Portland, Oregon. 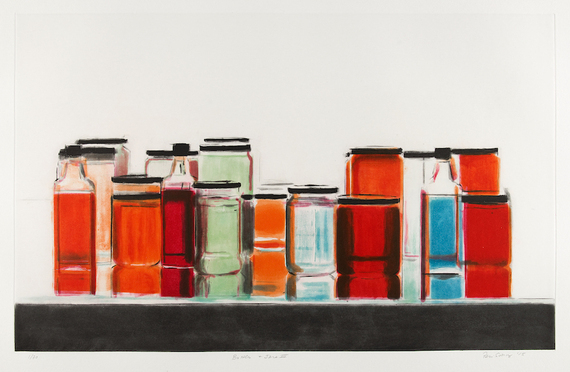 Curated by Mary Weaver Chapin, Phd., Curator of Prints and Drawings, “Now on View” highlights 58 out of the more than 1100 works on paper which have entered the Portland Art Museum’s collection since 2009 (the year the Museum last devoted an exhibition to recent acquisitions of works on paper). The impressive body of work featured in “Now on View” encompasses a broad variety of media, including woodcuts, engravings, etchings, mezzotints, lithographs, screen prints, drawings, and “Couplet”, the painterly monotype below by Betty Merken. This excellent exhibition features old master prints, nineteenth-century French and Belgian Prints with stunning examples from the invention of lithography, the etching revival, the color revolution of the 1890’s and contemporary art. Other contemporary artists in the exhibition include Magdalena Abakanowicz, Willie Cole, Sam Francis, Sol Lewitt, Pat Steir, Lisa Yuskavage and Martin Puryear. The exhibition opened on August 8 and will run through December 13, 2015. 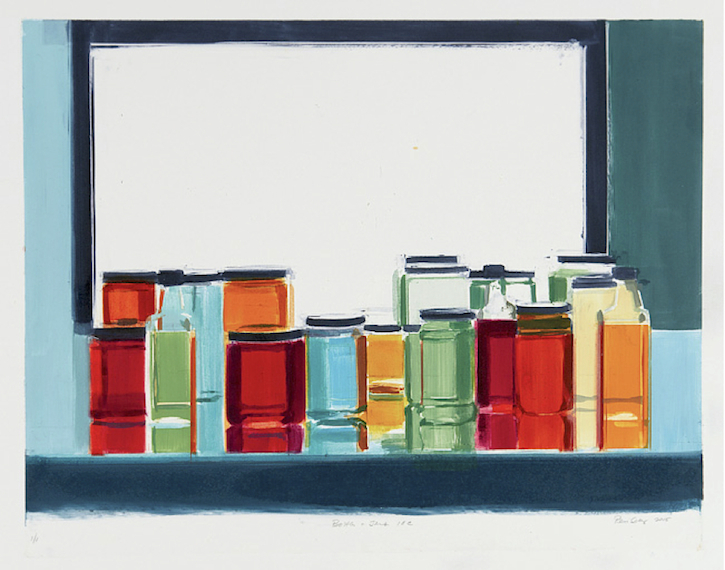 Betty Merken is celebrated for her painterly monotypes and for her perceptive and compelling use of color. 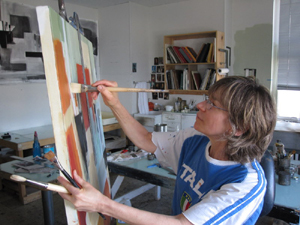 She is especially intrigued by the many ways in which her studio practices of painting, printmaking, and assemblage can come together to create one of a kind works which push the boundaries of conventional printmaking. “Couplet”. Unique print. Oil monotype on Rives BFK paper. Inked, printed, and published by the artist. 21” x 24”. Betty Merken. 2009. 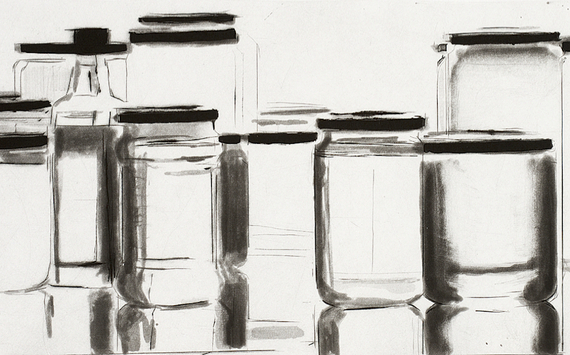 Art Werger’s recent etching “Night Fall” has been awarded the 2015 Guanlan International Print Prize in Guanlan China. Over 4000 works were submitted from around the world from which 257 works were selected for exhibition. Of these, eleven works were selected for awards. Mr. Werger will attend the presention at the reception in Guanlan, China on May 12th. of the place where so many cultures collide. He was always alert to his immediate surroundings, be that the texture on a wall in raking light, or a pattern of clouds reflecting off a glass building at sunset. The “now” somehow seeped into the ancient. A comprehensive look at Betty Merken’s signature approach to Printmaking in her Seattle studio. On October 16th, members of the Japanese Art Society of America (JASA) toured the Japanese Garden at Kykuit, part of the Rockefeller Family Estate and the former country home of John D. Rockefeller, now a historic site of the National Trust for Historic Preservation, in Pocantico Hills, NY. The tour was hosted by JASA Board Member Cynthia Altman, Curator of the Kykuit collections. During the tour, a demonstration of Tea was given by Tea Master Yoshihiro Terazono of the New York City Urasenke School with the expert assistance of Tomoko Urabe at the Garden Teahouse. 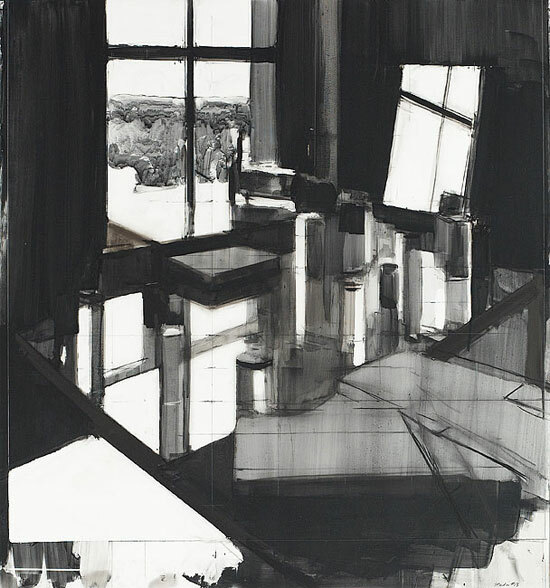 The painting, “Summer Morning V” (above left), by renowned artist Robert Kipniss is part of an exhibition at the Heckscher Museum in Huntington, Long Island. The show is called “Recent Acquisitions” and is comprised of 24 works acquired by the Museum since 2010. The show opens Saturday, August 17, and runs until November 24. Also, two of Mr. Kipniss’es mezzotints and the two plates they were pulled from are now in the permanent collection of the Detroit Institute of Arts. 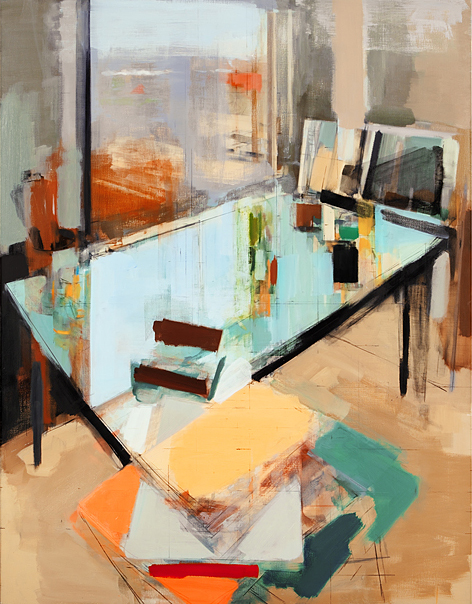 Peri Schwartz, whose work is currently on view in the three-person exhibition “Dwellings” at the Gerald Peters Gallery in Santa Fe, is a formalist and a seeker of harmonies. 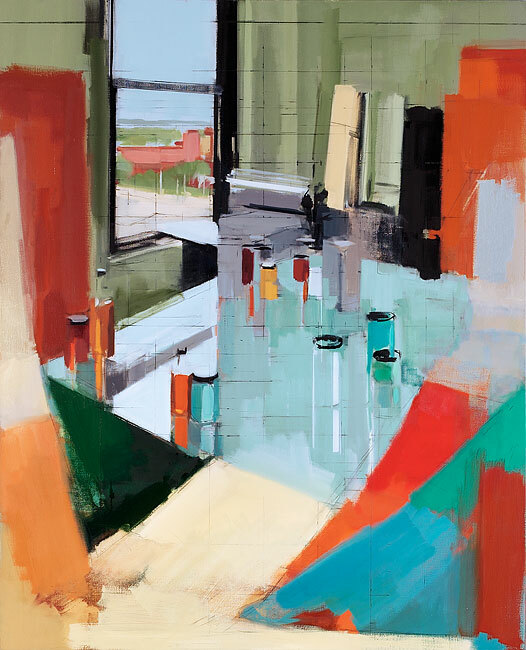 Schwartz’s compositions get their rigor from the implied presence of a grid, which she offsets and punctuates with painterly gestures and harmonies of color and value. 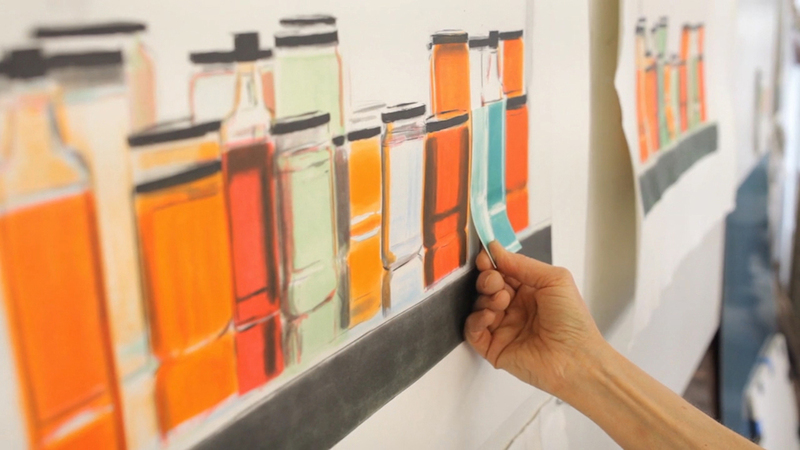 Her most recent oils — studio interiors and still lifes of translucent bottles and jars — have the expressive vitality of perfectly executed chamber music. Boston University’s School of Fine Arts was a very serious place and I was in bliss. 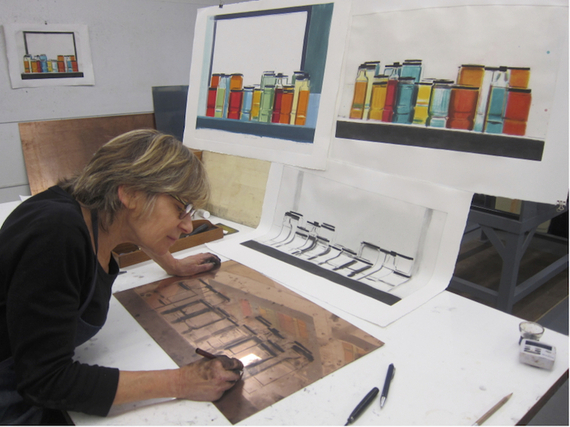 Our training in drawing and painting was traditional and very rigorous. Joseph Ablow taught composition and it was my favorite class. He had studied with Albers at Yale and was brilliant in demonstrating how a painting is constructed. He introduced me to Morandi, an artist that continues to inspire me. Sometimes BU could be a bit too traditional. I was fortunate to be at a summer program BU had at Tanglewood. 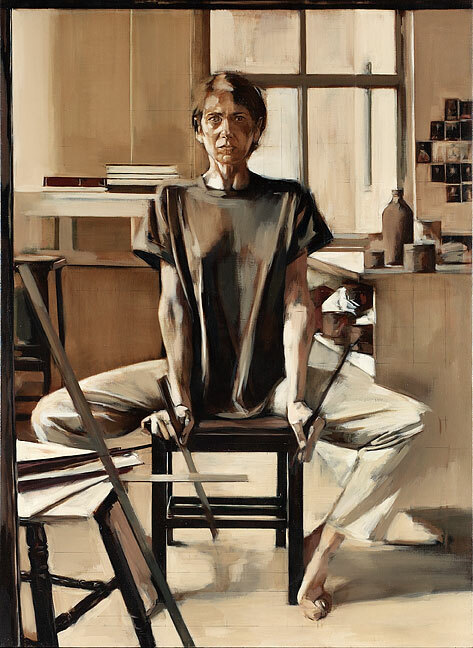 There I studied with Robert D’Arista, a terrific painter and teacher from American University. Unlike the teachers at BU, he wanted us to work quickly and intuitively. It shook me up quite a bit and I did some of my best student work that summer. You have said that the “grid is not a restriction.” Can you expand on that? I don’t begin with a grid, the grid emerges. 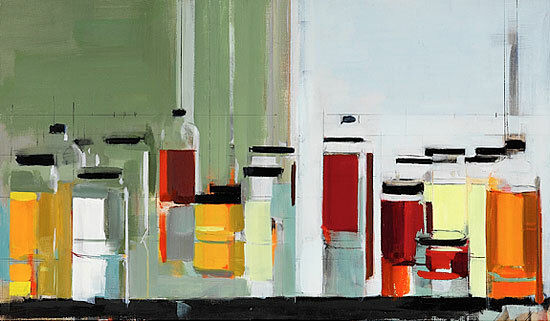 For example, in my Bottles and Jars paintings, I randomly set up the bottles and jars on the table. In trying to find the middle of the composition I measure where that will be. From there I divide it again and this is how the grid comes into play. It’s a tool that helps me find the intervals. Often I will draw a line that is part of the grid, confident that it belongs where I drew it. As the painting progresses I inevitably move the bottles or jars and paint over part of the line. When the painting is done there are grid lines that weave in and out of the composition but are never uniform. Many artists are afraid of rulers, but you aren’t. Do you have a background in drafting? For me, finishing a painting is a balancing act. I want to retain the freshness of the paint and at the same time get everything in the right position. The painting is usually finished when I can’t bear to move one more object. 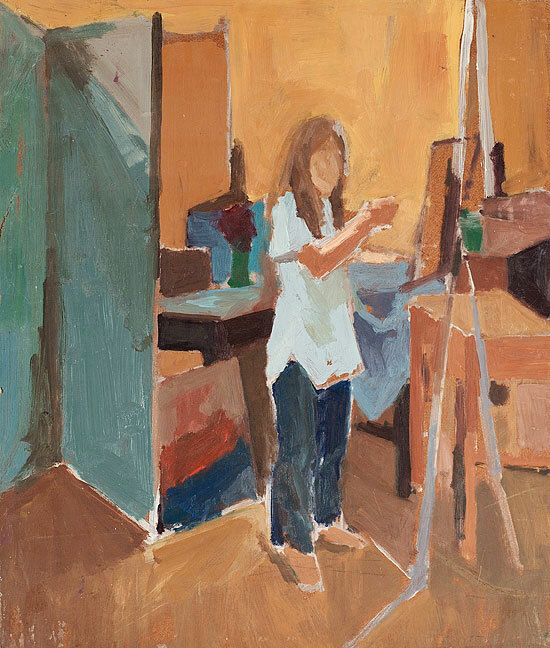 From the beginning of my art education, I have been interested in the compositions of great paintings, particularly Degas, Morandi and Diebenkorn. What interests me most is how they take a subject and use it to make a brilliant composition. 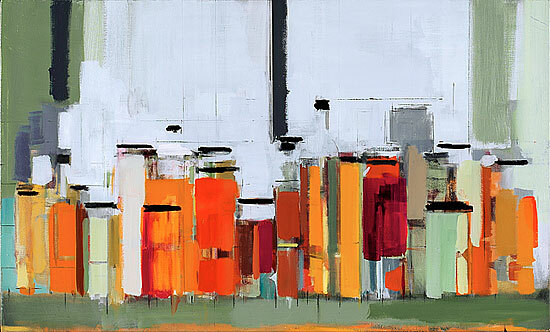 I tend to seesaw back and forth with paintings that are more and then less abstract. 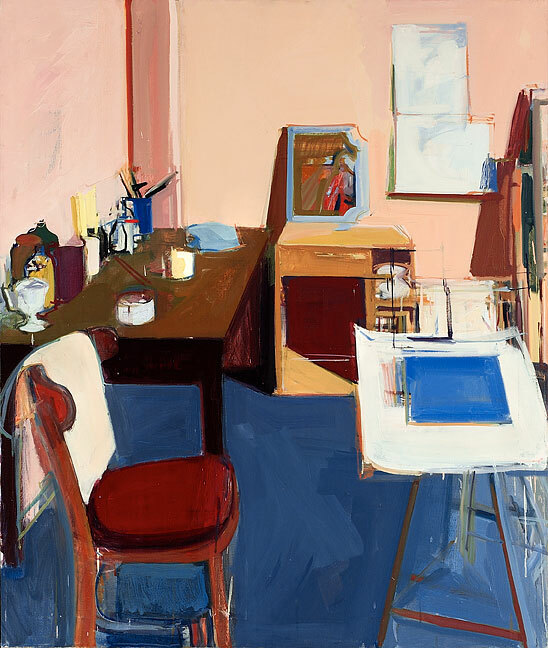 Because working directly from life is so essential to me, I can’t imagine doing a painting or drawing where the viewer is left without a sense of real space. Being on that edge is where I want to be. Listening to classical music, especially small ensembles, is vital to me. I go to concerts frequently and aside from getting emotionally involved in the music, I like to watch how the musicians communicate with each other. When I am back at the studio, the relationships between my still life objects remind me of the communication I observed between the musicians. Painting is like breathing for me: I couldn’t live without it. We at ebo Gallery mourn the passing of celebrated artist Will Barnet, who died at his home in New York on Tuesday. He was 101. USA Projects is a dynamic new creative community that connects people with great artists and helps them to make tax-deductible contributions to projects. Two interesting videos of Jean Gumpper recounting her recent experience during an artist residency in Death Valley last April.